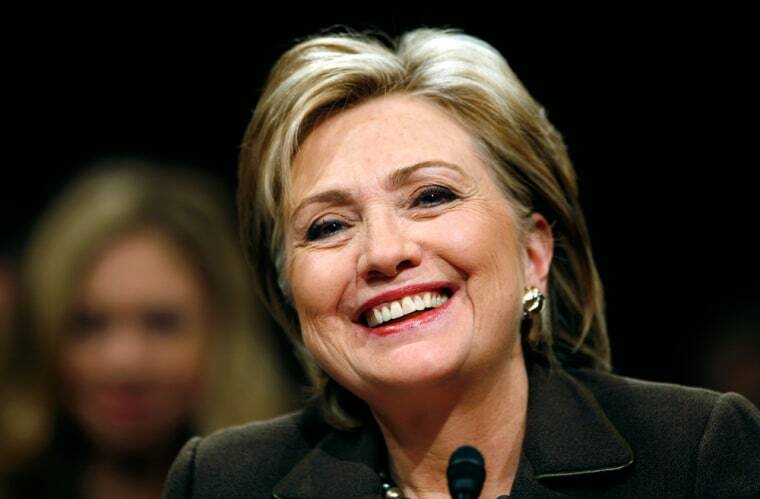 Hillary Clinton’s life has taken her from first lady to senator to secretary of state. From First Lady to U.S. Secretary of State and U.S. 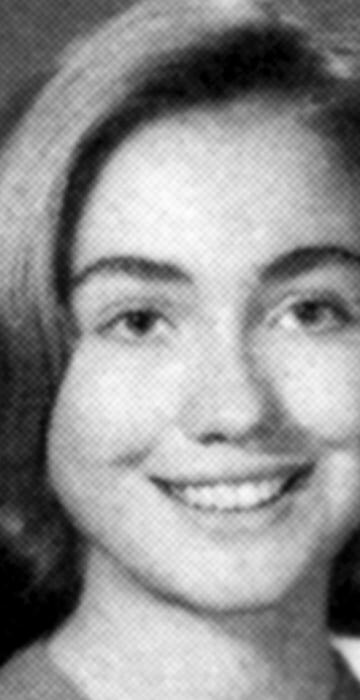 Senator to candidate for President, see photos of Hillary from her early days at Yale Law School. 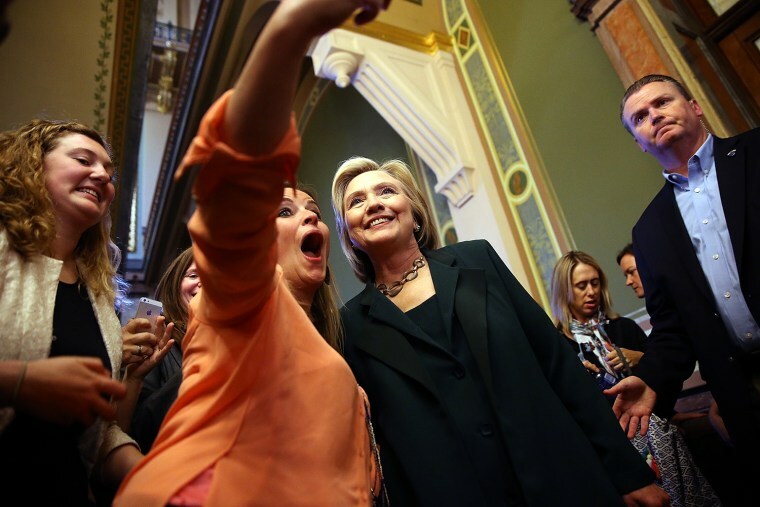 Democratic presidential hopeful and former Secretary of State Hillary Clinton stops to take a selfie after meeting with members of the Iowa State legislature at the Iowa State Capital on April 15, 2015 in Des Moines, Iowa. Hillary Clinton continues to campaign throughout Iowa as she makes her second bid for President of the United States. 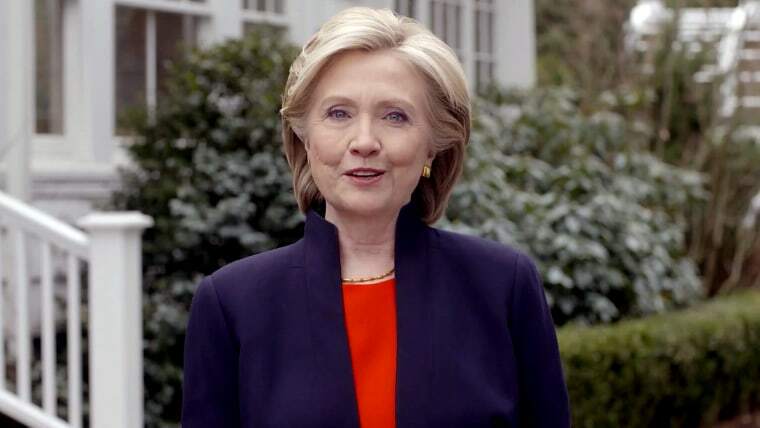 A videograb made on April 13, 2015 and taken from the hillaryclinton.com website shows former US First Lady and former Secretary of State Hillary Clinton annoucing her presidential candidacy for the upcoming 2016 election in the United States. 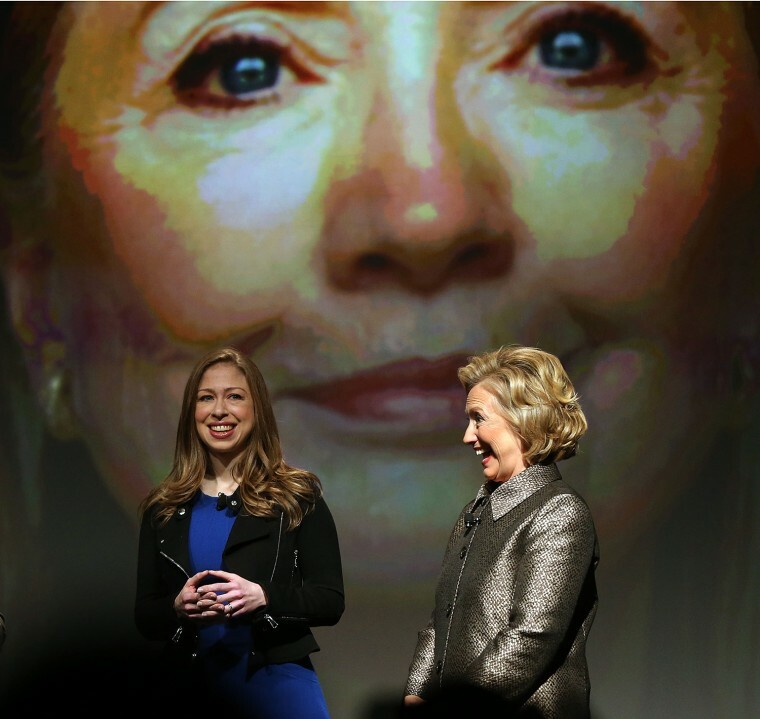 Casting herself as a champion of "everyday Americans," Hillary Clinton on April 12, 2015 finally launched her campaign to become the first female tenant of the White House. Seven years after her bitter nomination defeat to Barack Obama, Clinton jumps into the race still the overwhelming Democratic favorite, as her Republican rivals gird for a bruising primary. 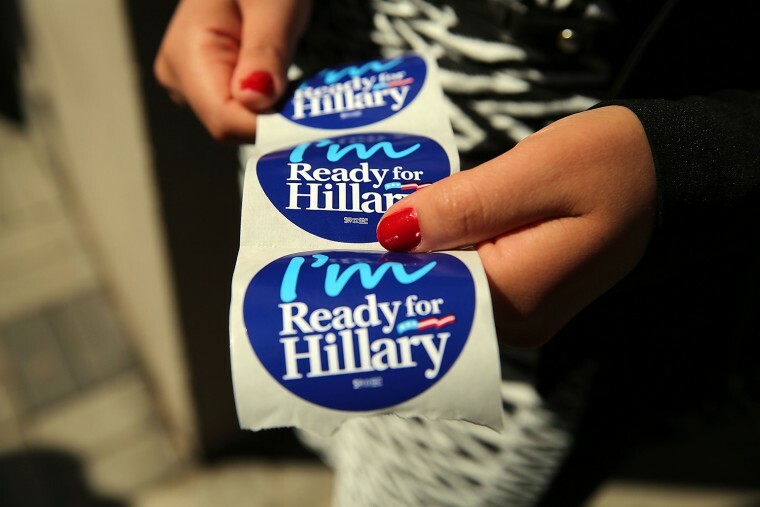 Stickers are handed out to supporters of Hillary Rodham Clinton's yet to be announced presidential campaign at a rally in Manhattan on April 11, 2015 in New York City. It is expected that Clinton will end months of speculation and launch her anticipated 2016 presidential campaign with an announcement on social media. 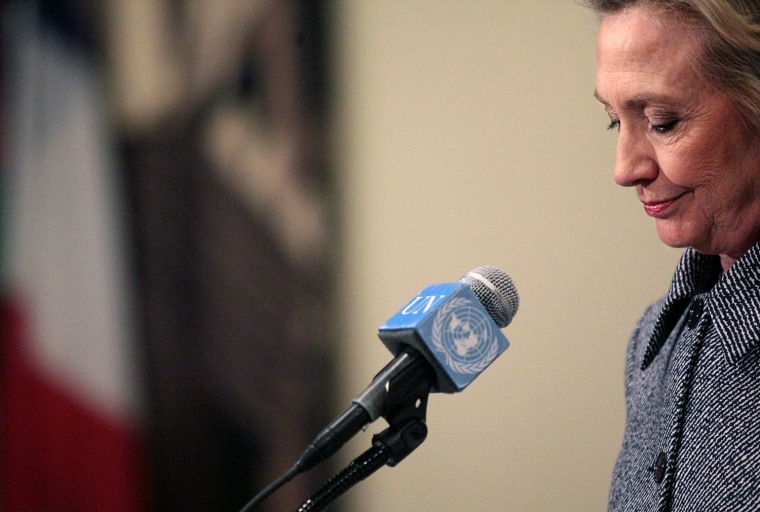 Former U.S. Secretary of State Hillary Clinton speaks to the media after keynoting a Women's Empowerment Event at the United Nations March 10, 2015 in New York City. Clinton answered questions about recent allegations of an improperly used email account during her tenure as secretary of state. Former Secretary of State Hillary Rodham Clinton joins her daughter and Clinton Foundation Vice Chair Chelsea Clinton for the official release of the No Ceilings Full Participation Report which coincides with the start of the 59th session of the United Nations' Commission on the Status of Women on March 9, 2015 in New York City. 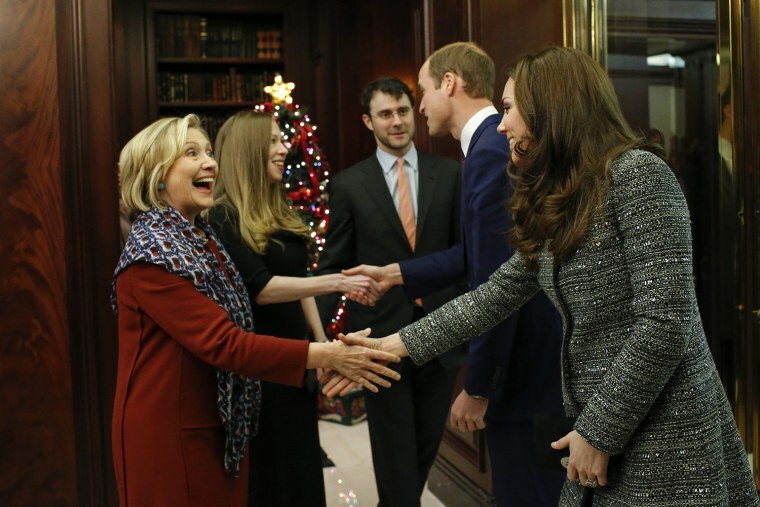 From left to right, Hillary Rodham Clinton, Chelsea Clinton, Marc Mezvinsky, Prince William, Duke of Cambridge and Catherine, Duchess of Cambridge attend a reception co-hosted by the Royal Foundation and the Clinton Foundation at British Consul General's Residence on December 8, 2014 in New York City. 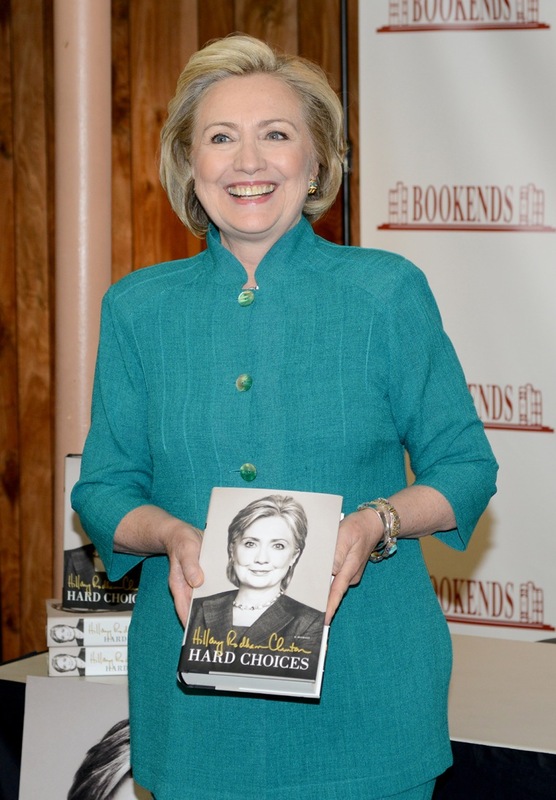 Hillary Rodham Clinton signs copies of her book "Hard Choices" at Bookends Bookstore on July 17, 2014 in Ridgewood, New Jersey. Secretary of State Hillary Clinton bids farewell on her last day in office at the State Department in Washington Feb. 1, 2013, saying she is "confident about the direction that we have set." 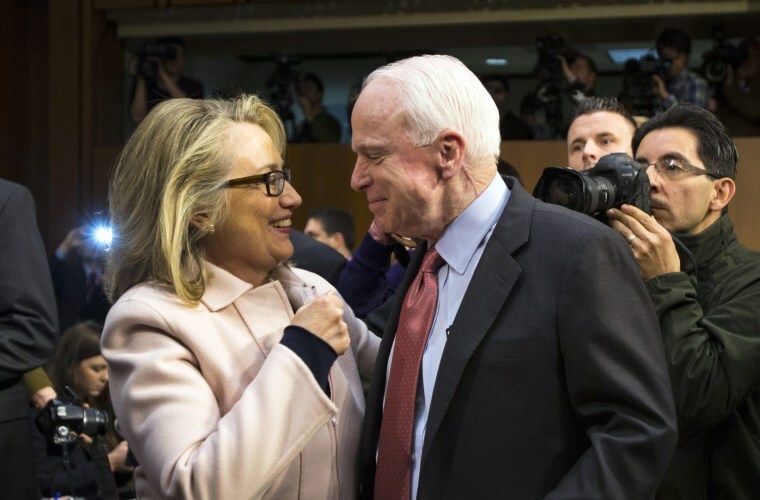 Clinton greets Senator John McCain before Senator John Kerry's confirmation hearing to become the next Secretary of State, on Capitol Hill in Washington, D.C., Jan. 24, 2013. 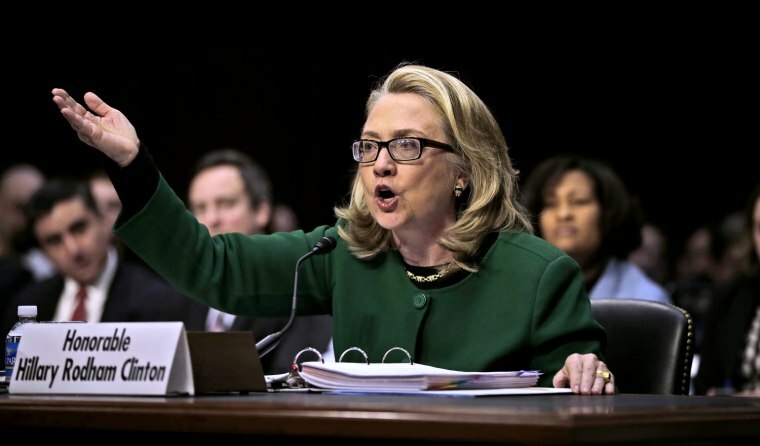 Clinton testifies on Capitol Hill in Washington, D.C., Jan. 23, 2013, during the Senate Foreign Relations Committee hearing on the deadly attack on the U.S. diplomatic mission in Benghazi, Libya, that killed Ambassador Chris Stevens and three other Americans. 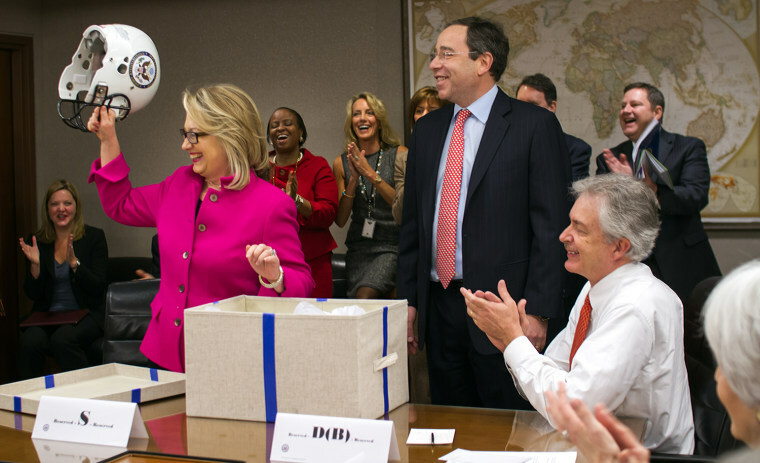 At the State Department in Washington, D.C., Secretary of State Hillary Clinton holds a football helmet she received as a gift upon her return to work on Jan. 7, 2013 following a month-long absence caused by a series of health scares, including a blood clot in her head. Clinton became ill on her return from a trip to Europe on Dec. 7 and was hospitalized for a few days in New York. 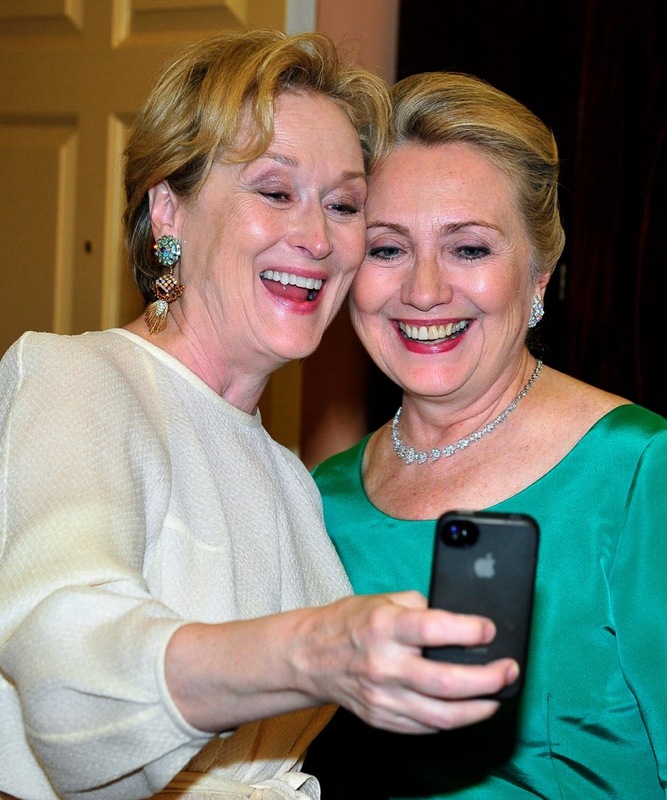 Meryl Streep takes a photo of herself with Secretary of State Hillary Clinton following a dinner for Kennedy Center honorees hosted by Clinton at the State Department, Dec. 1, 2012 in Washington, D.C.
Secretary of State Hillary Clinton walks with Palestinian President Mahmoud Abbas after their meeting in the West Bank city of Ramallah on Nov. 21, 2012. 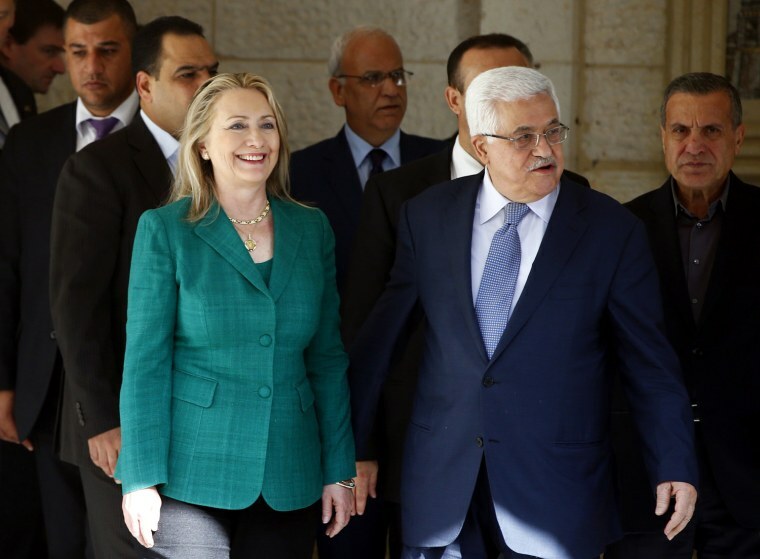 Israeli air strikes shook the Gaza Strip and Palestinian rockets struck across the border as Clinton held talks in Jerusalem in the early hours resulting in a cease-fire just at the moment when despair had set in. 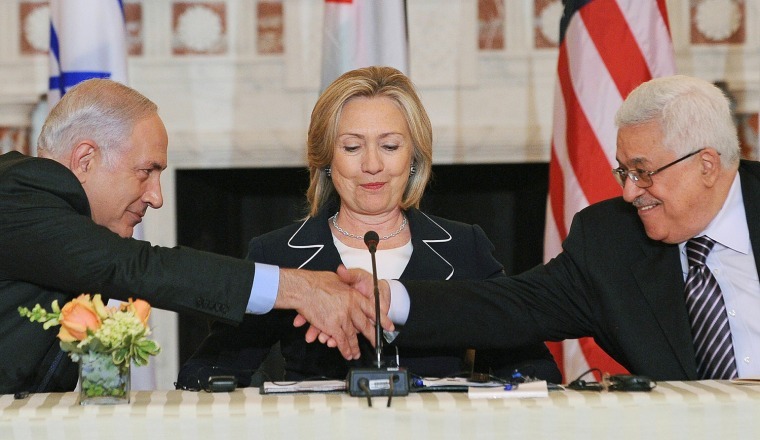 Calls from Obama and the Egyptian goverenment had not produced the desired results, so Clinton joined Eyptian Foreign Minister Mohamed Kamel Arm for a visit to the region and a deal was brokered. 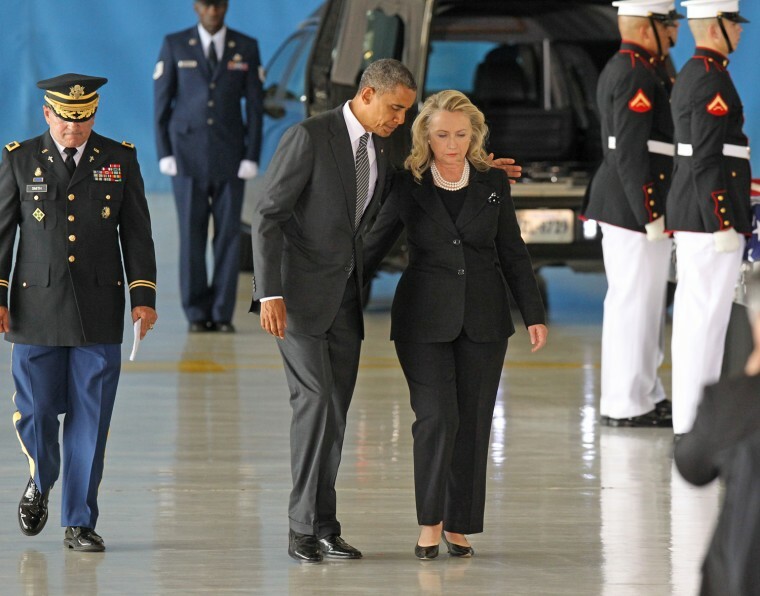 President Obama and Secretary of State Hillary Clinton walk away from the podium during the Transfer of Remains Ceremony for the return of Ambassador Christopher Stevens and three other Libyan embassy employees at Joint Base Andrews in Maryland on Sept. 14, 2012. September 14. 2012 in Joint Base Andrews, Maryland. Stevens and the three other embassy employees were killed when the consulate in Libya was attacked on Sept. 11. 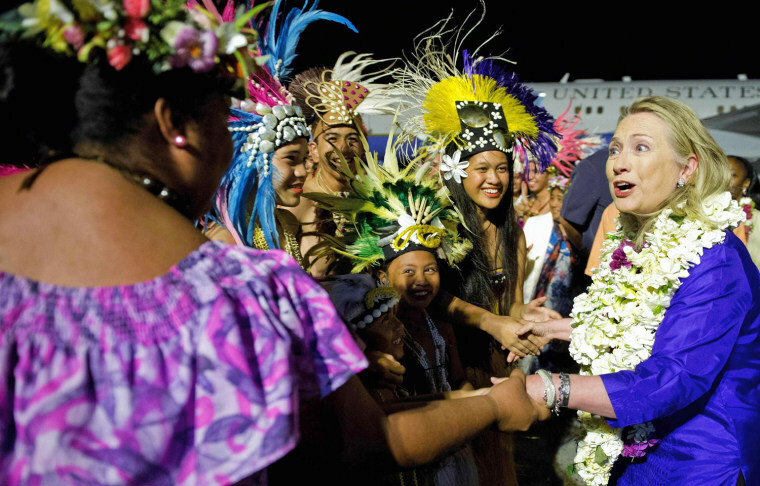 Secretary of State Hillary Clinton is greeted in an arrival ceremony at Rarotonga International Airport in Rarotonga, the most populous of the Cook Islands, on Aug. 30, 2012. Clinton voiced hope during the trip that the United States would act beyond its pledges on curbing emissions as she visited Pacific islands threatened by climate change. 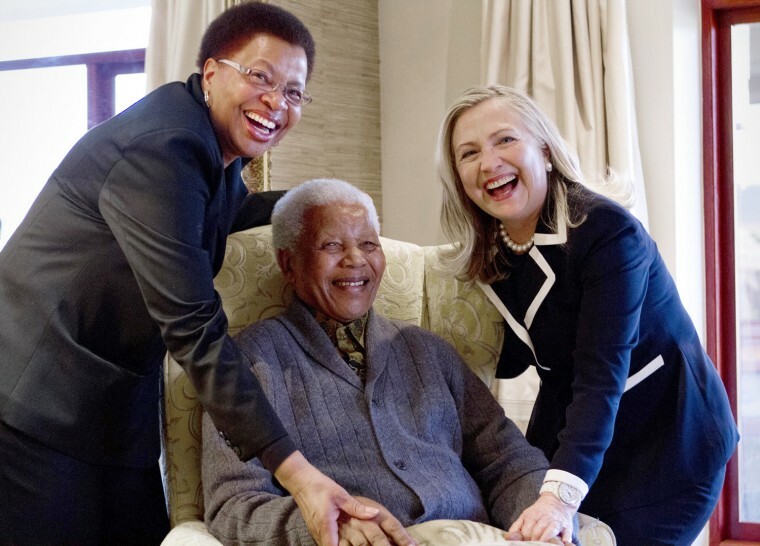 Secretary of State Hillary Rodham Clinton poses with Nelson Mandela, 94, former president of South Africa, and his wife Graca Machel at his home in Qunu, South Africa, on Aug. 6, 2012. Her private lunch with the Nobel Peace Prize winner was the first event of her South African visit, an indication of the prestige still enjoyed by the man who led the fight against white-minority rule. The two chatted in his home ahead of the meal, an honor that few receive as Mandela's health has become more fragile with age. 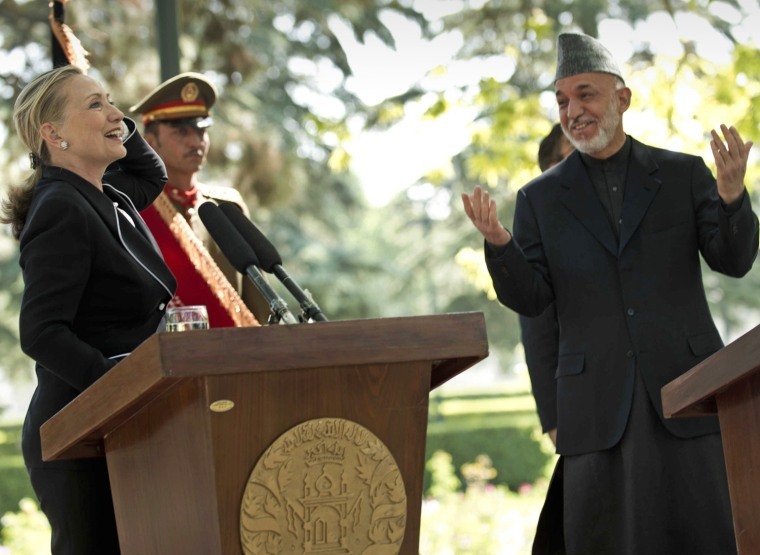 Secretary of State Hillary Clinton laughs during a press conference with Afghan President Hamid Karzai at the Presidential Palace in Kabul on July 7, 2012. The Obama administration on Saturday declared Afghanistan the United States' newest "major non-NATO ally," an action designed to facilitate close defense cooperation after U.S. combat troops withdraw from the country in 2014 and as a political statement of support for Afghanistan's long-term stability. 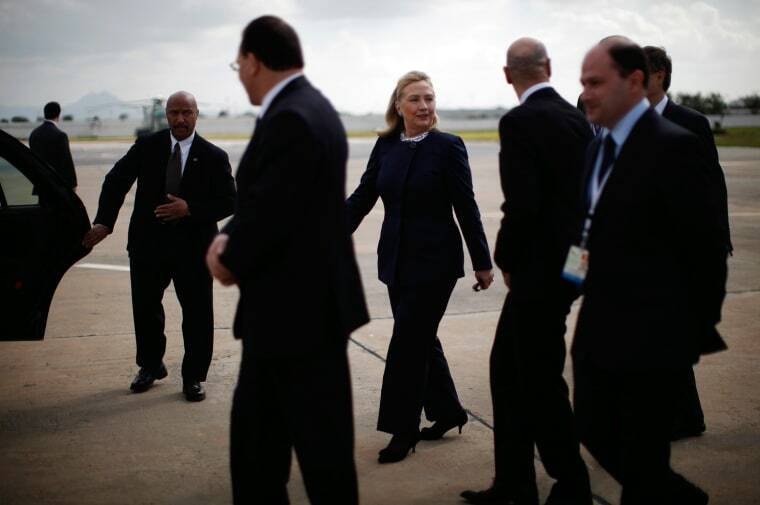 Secretary of State Hillary Clinton arrives in Tunis, Tunisia on Feb. 24, 2012 for meetings with Western and Arab nations to demand that Syria implement an immediate ceasefire to allow aid in for desperate civilians in the absence of an international consensus on intervention. 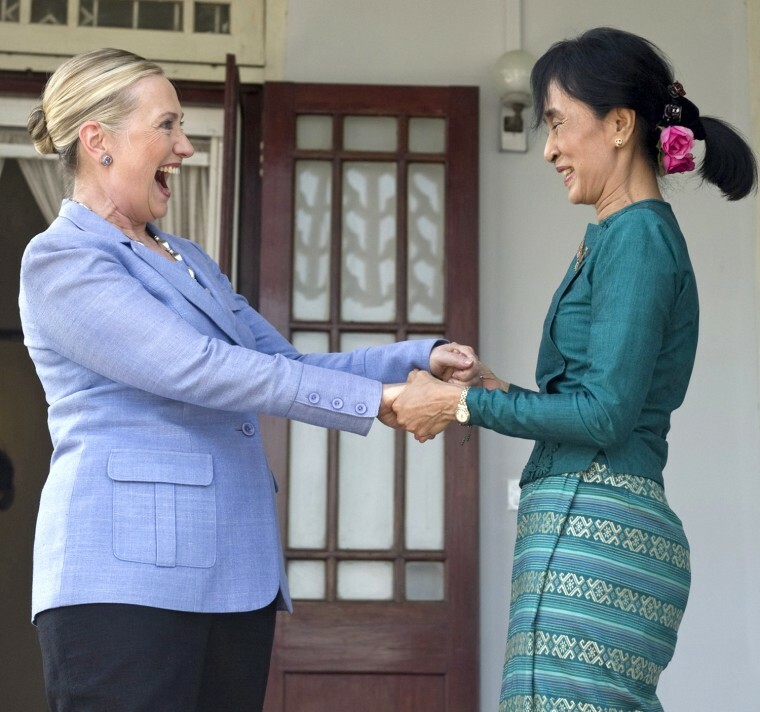 Pro-democracy opposition leader Aung San Suu Kyi and Secretary of State Hillary Clinton hold hands as they speak after meeting at Suu Kyi's residence in Yangon, Myanmar, Dec. 2, 2011. Clinton traveled to the country on a two-day visit, the first by a U.S. Secretary of State in more than 50 years. 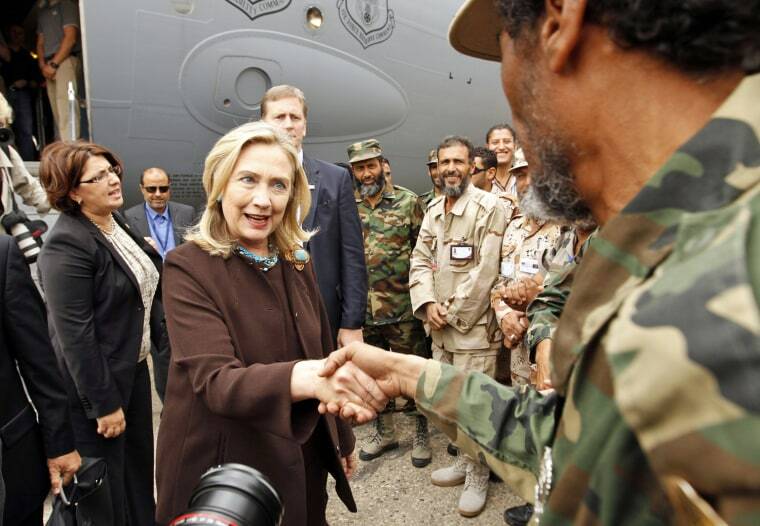 Secretary of State Hillary Clinton meets National Transitional Council officials at the steps of her C-17 military airplane upon her arrival in Tripoli, Libya, on Oct. 18, 2011, to hold talks with officials in Libya's new regime. 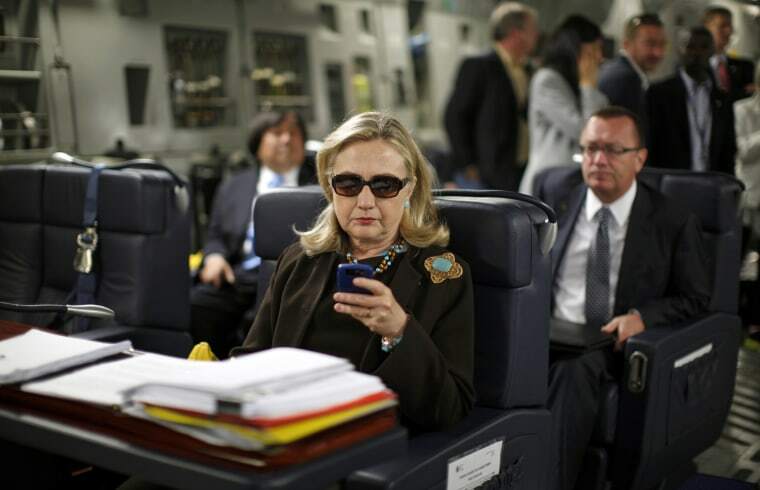 Secretary of State Hillary Clinton checks her mobile device upon her departure in a military C-17 plane from Malta bound for Tripoli, Libya, Oct. 18, 2011. 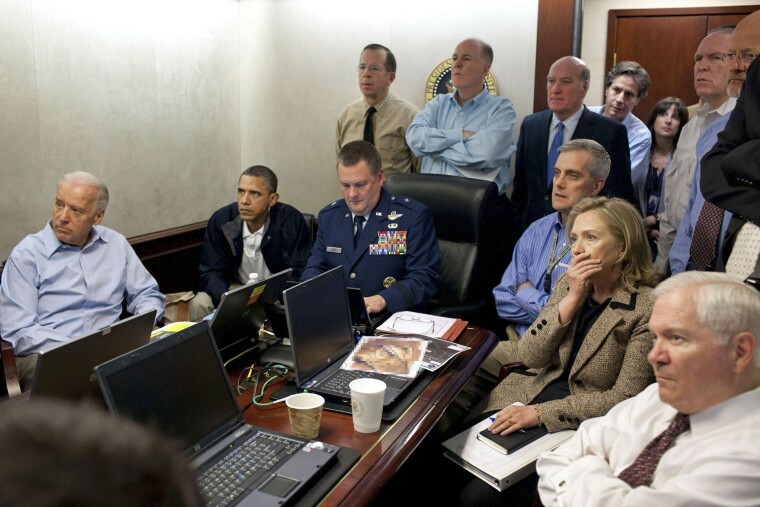 Secretary of State Hillary Clinton, President Obama and Vice President Joe Biden, left, along with members of the national security team, receive an update on the mission against Osama bin Laden in the Situation Room of the White House on May 1, 2011. 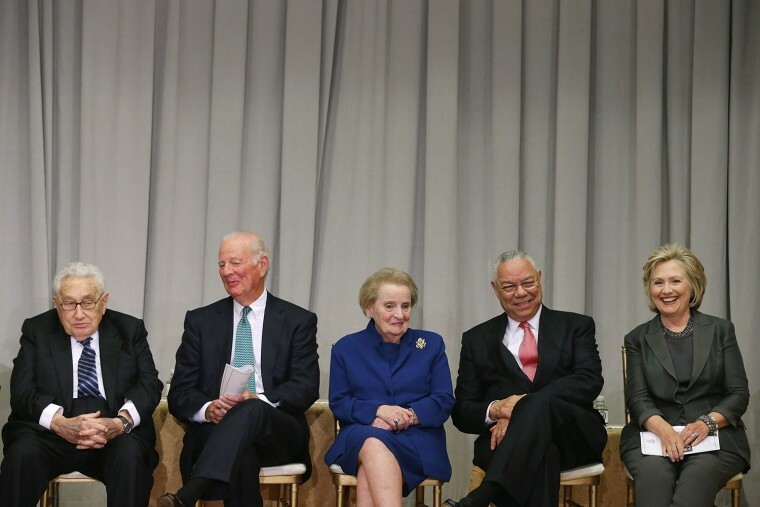 Also pictured is Defense Secretary Robert Gates, right. A classified document seen in this photograph has been obscured by the source. Secretary of State Hillary Clinton looks on as Prime Minister Benjamin Netanyahu of Israel, left, and President Mahmoud Abbas of the Palestinian Authority shakes hands as they re-launch direct negotiations between Israel and the Palestinian Authority at the State Department in Washington on Sept. 2, 2010. 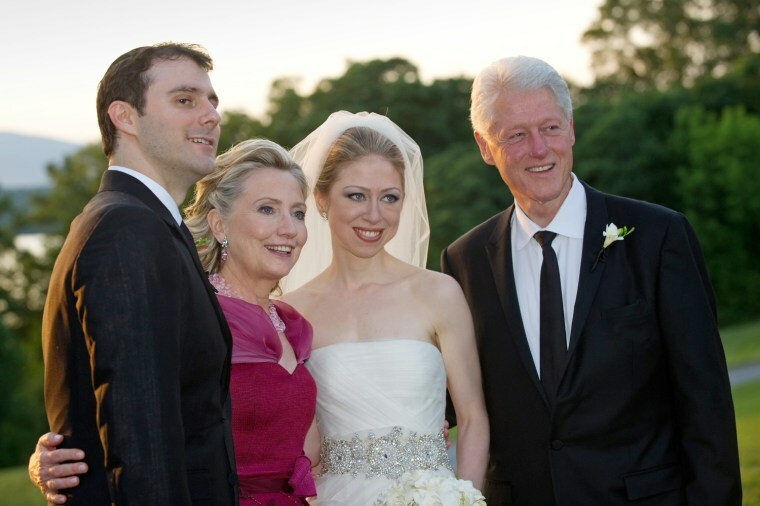 Former President Bill Clinton and Secretary of State Hillary Clinton stand with their daughter Chelsea Clinton during her marriage ceremony with Marc Mezvinsky on July 31, 2010 in Rhinebeck, N.Y. Chelsea Clinton married her longtime boyfriend Mezvinsky, ending weeks of secretive build-up about the former first daughter's wedding. "Today, we watched with great pride and overwhelming emotion as Chelsea and Marc wed in a beautiful ceremony at Astor Courts, surrounded by family and their close friends," Bill & Hillary Clinton said in a statement. 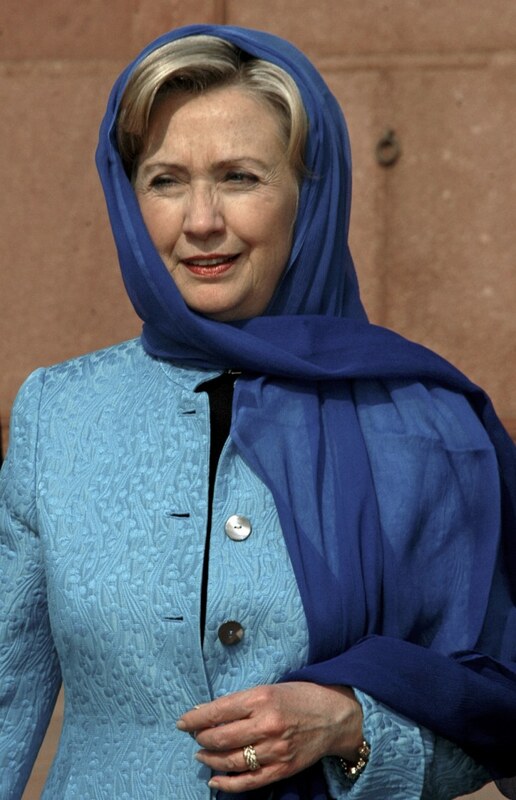 Secretary of State Hillary Clinton visits the historical Badshahi Mosque in Lahore, Pakistan, on Oct. 29, 2009. 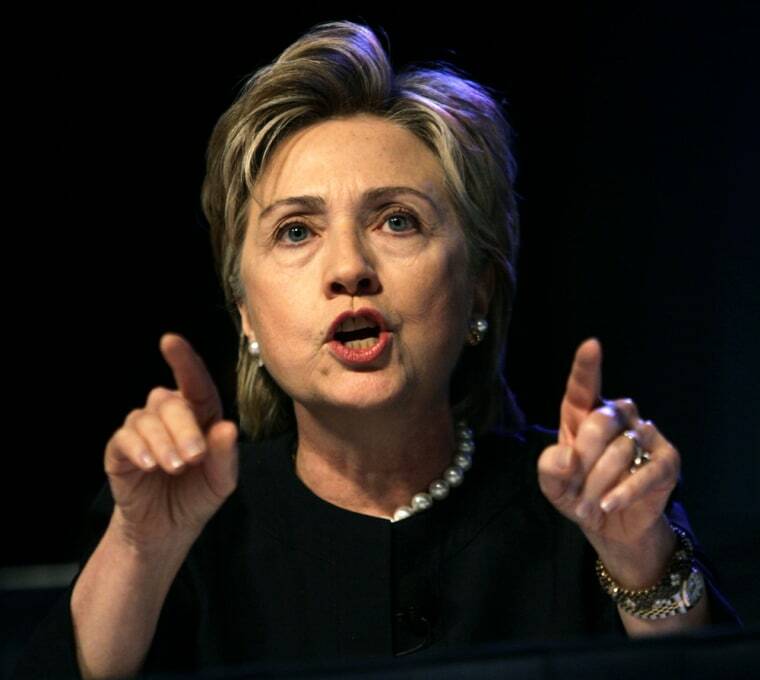 Clinton said on Thursday it was "hard to believe" that no one in Pakistan's government knew where al Qaeda leaders were hiding, striking a new tone on a trip where Washington's credibility has come under attack. 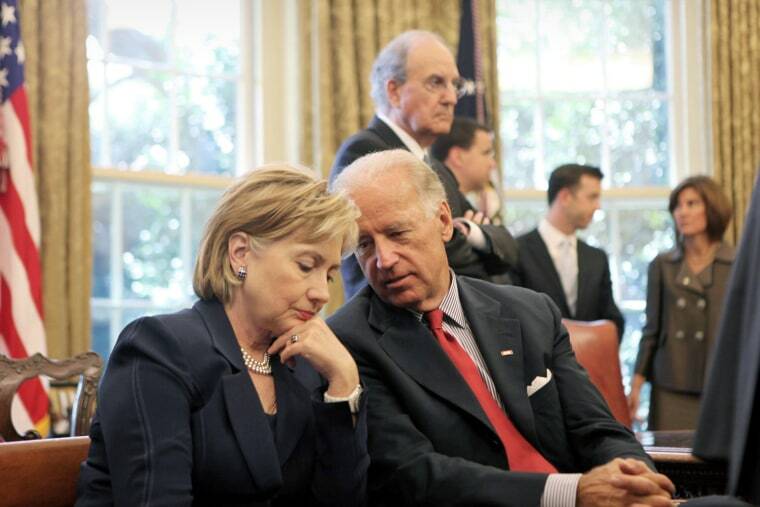 Secretary of State Hillary Rodham Clinton listens to Vice President Joseph Biden as President Barack Obama meets with Egyptian President Hosni Mubarak in the Oval Office on Aug. 18, 2009. Former Sen. George Mitchell is in the background. 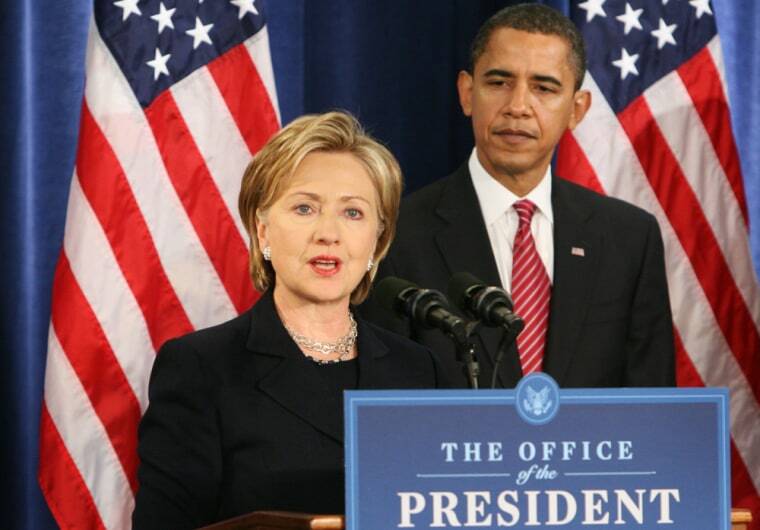 Sen. Hillary Clinton speaks to the media after President-elect Barack Obama introduces her as his choice for secretary of state, during a press conference in Chicago on Dec. 1, 2008. Sen. Hillary Clinton speaks to supporters at the National Building Museum on June 7, 2008 in Washington. Clinton endorsed Democratic presidential hopeful Sen. Barack Obama and thanked her supporters for standing behind her in one of the longest Democratic primary seasons in history. 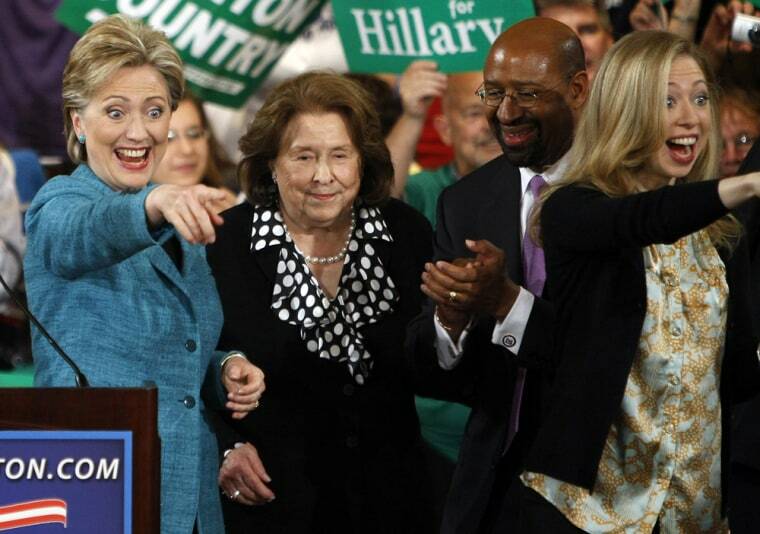 Sen. Clinton, her mother Dorothy Rodman, and her daughter Chelsea Clinton take the stage at a celebration in Philadelphia on April 22, 2008, the night of the Pennsylvania primary. Democratic presidential hopefuls Sens. 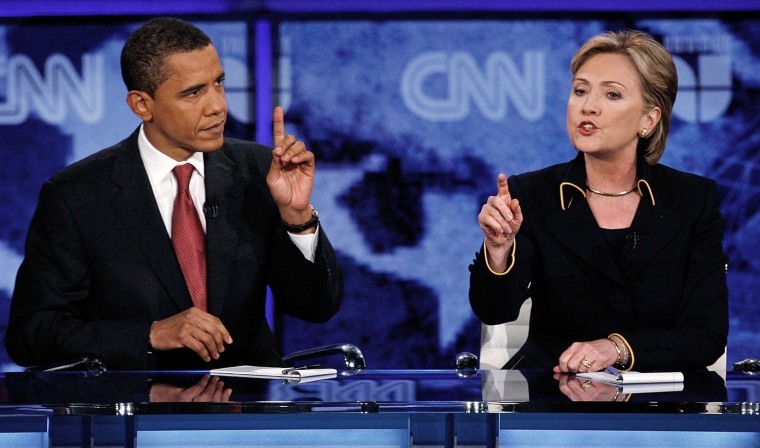 Barack Obama and Hillary Rodham Clinton exchange words during a debate in Austin, Texas, on Feb. 21, 2008. 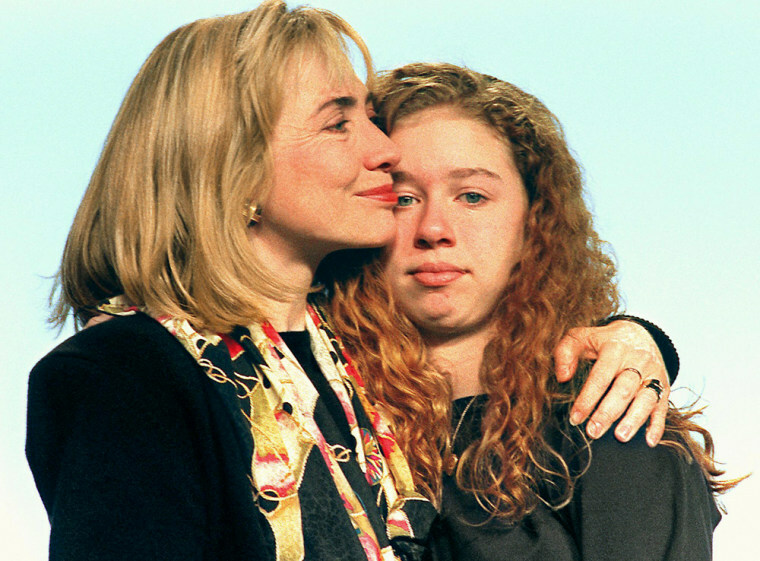 Sen. Hillary Clinton, D-N.Y., hugs her daughter, Chelsea, at her Feb. 5, 2008 Super Tuesday primary night rally in New York. 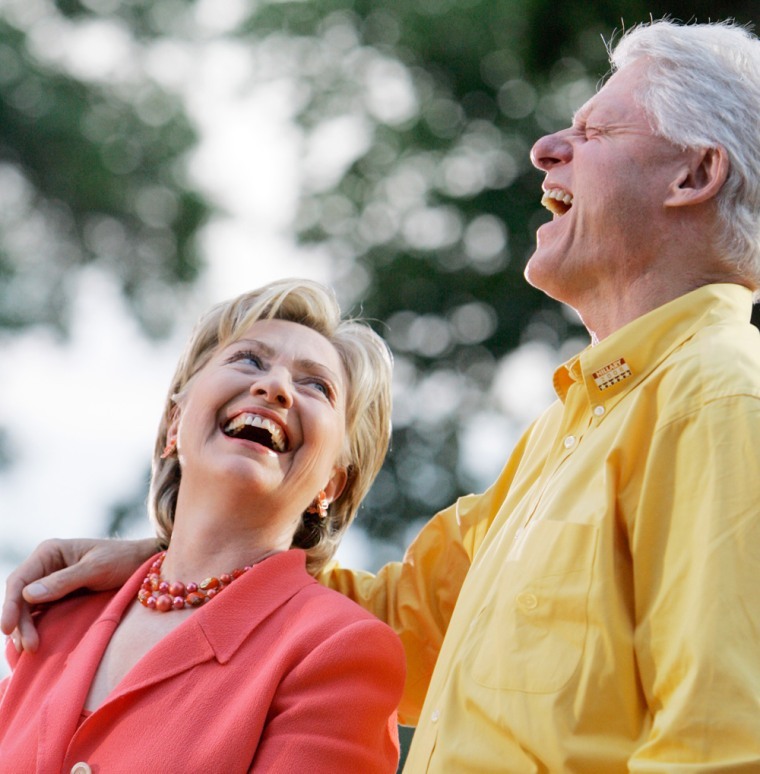 Sen. Hillary Clinton, D-N.Y., accompanied by her husband, former President Bill Clinton, laughs as they are introduced at a Rally for Change at the Iowa State Fairgrounds in Des Moines, July 2, 2007. It was the first time the former president campaigned for his wife. 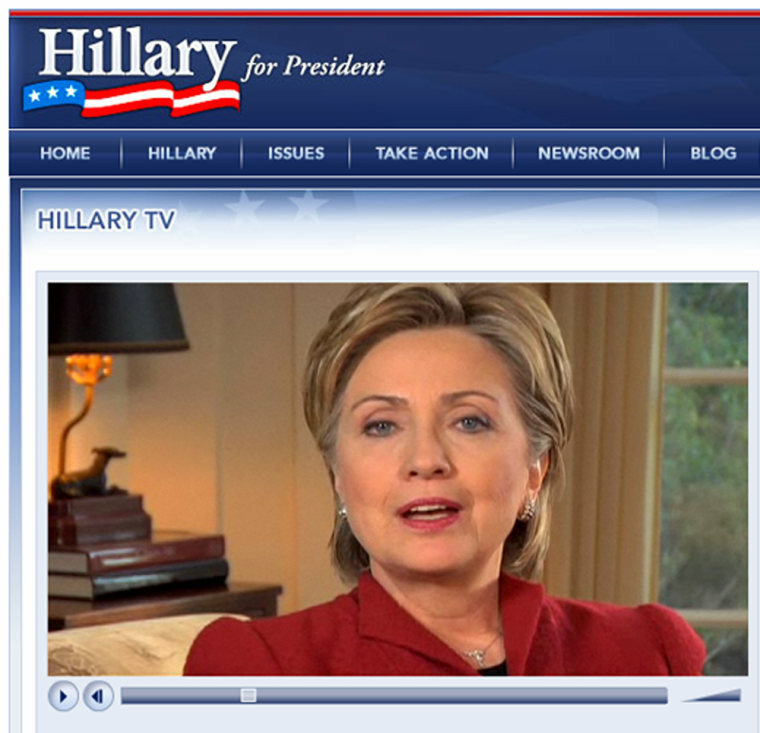 In a message on her Web site Jan. 20, 2007 Hillary Clinton discusses her plans to form an exploratory committee on seeking the presidency of the United States. Sen. Hillary Rodham Clinton, speaks at the annual NAACP convention in Washington on July 19, 2006. 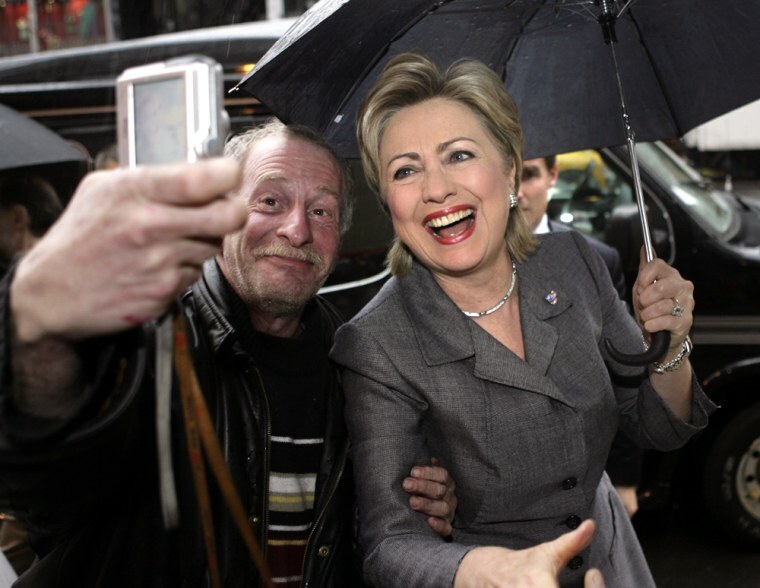 Sen. Hillary Rodham Clinton takes pictures and shakes hands with supporters outside of a firehouse in New York, on Nov. 8, 2006 - the day after she coasted to a second Democratic term in New York, winning roughly 70 percent of the vote. 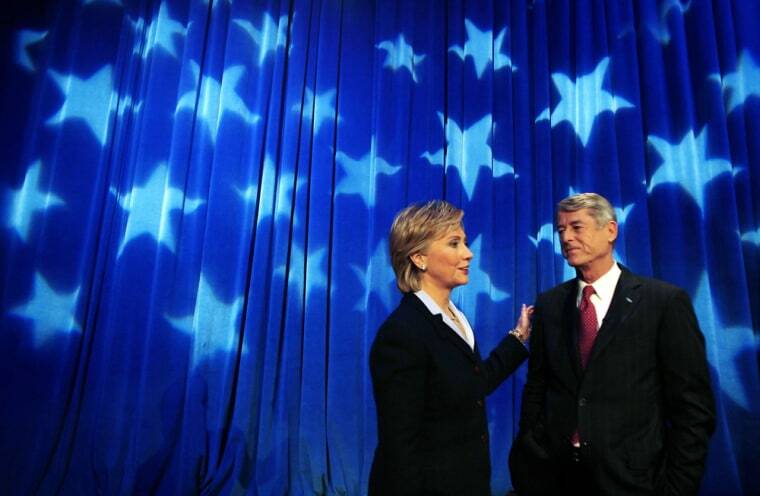 Sen. Hillary Rodham Clinton greets her Republican challenger, John Spencer, at the start of their senatorial debate in New York Oct. 22, 2006. 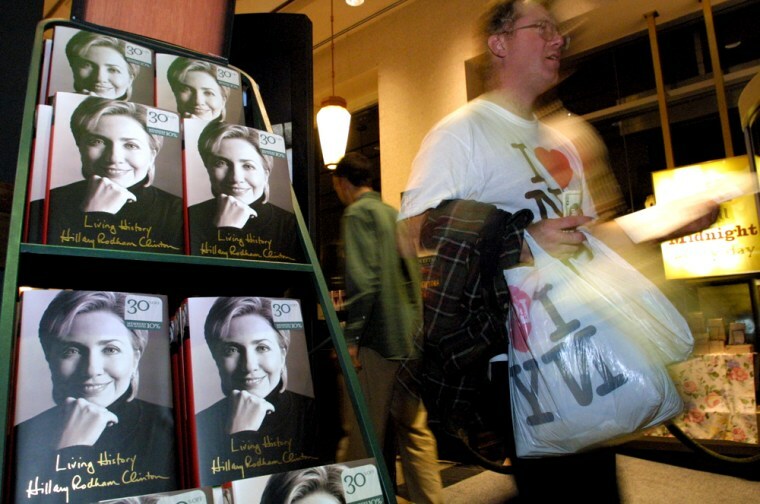 Richard Fullam, of Boston, passes by a display of Hillary Rodham Clinton's autobiography, "Living History" in New York shortly after the book's release at midnight on June 9, 2003. 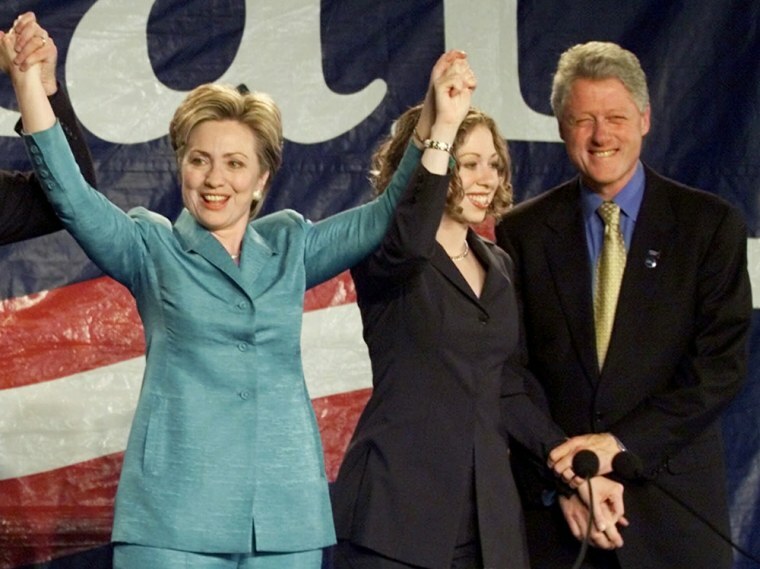 Former first lady and New York Sen.-elect Hillary Clinton celebrates with former President Clinton and their daughter Chelsea, during her victory rally in New York, on Nov. 7, 2000. 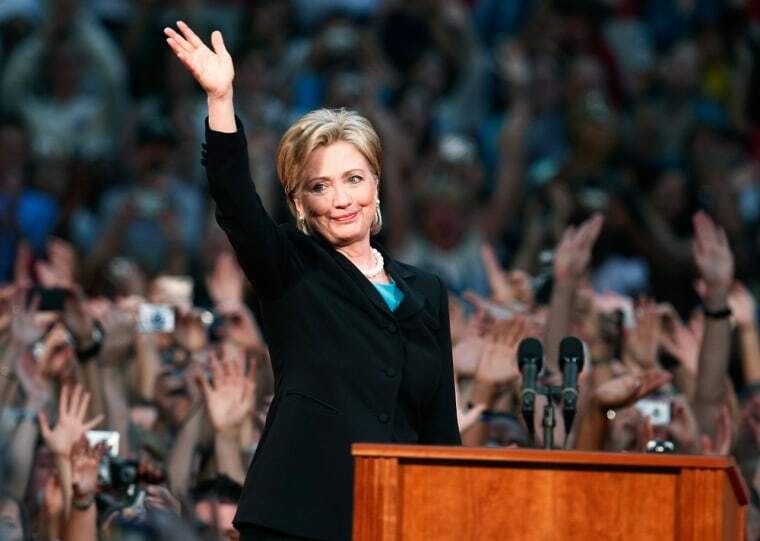 Mrs. Clinton defeated Republican Rep. Rick Lazio to become the first presidential spouse elected to Congress. 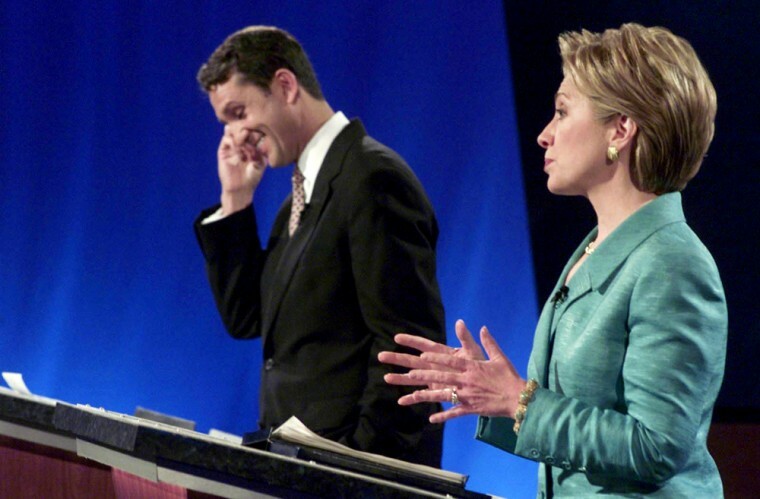 Republican Senate candidate Rick Lazio smiles as first Hillary Rodham Clinton makes a point during their first debate for the senate race at the WNED-TV studios, 13 Sept. 13, 2000, in Buffalo, New York. 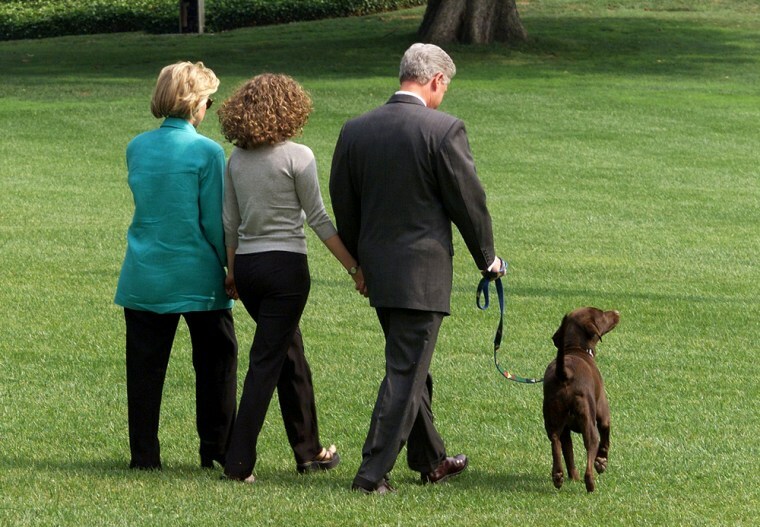 First lady Hillary Clinton, daughter Chelsea and President Bill Clinton and the family dog, Buddy, depart the White House for a two-week vacation at Martha's Vineyard on Aug. 18, 1998 - the day after the president gave a televised address to the American people regarding his grand jury testimony in which he admitted to an improper relationship with former White House intern Monica Lewinsky. 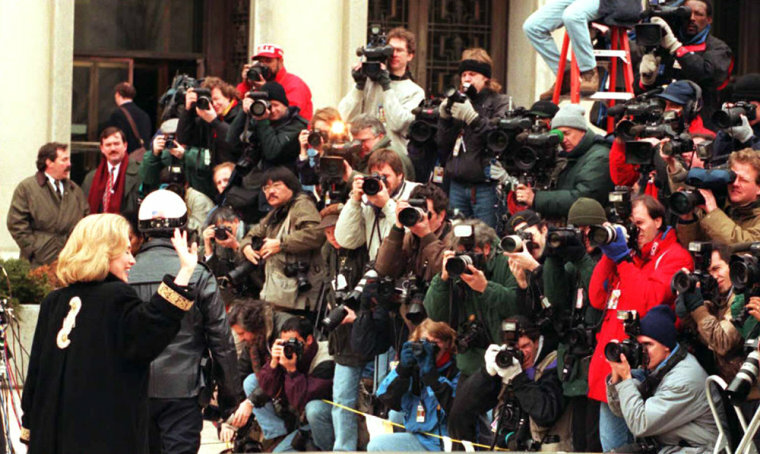 First lady Hillary Clinton waves to the media on Jan. 26, 1996, as she arrives at federal court in Washington for an appearance before the grand jury investigating the Whitewater land deal. First lady Hillary Clinton, heading the president's health care reform effort, talks to reporters on March 16, 1993, in the hallway in the West Wing of the White House. 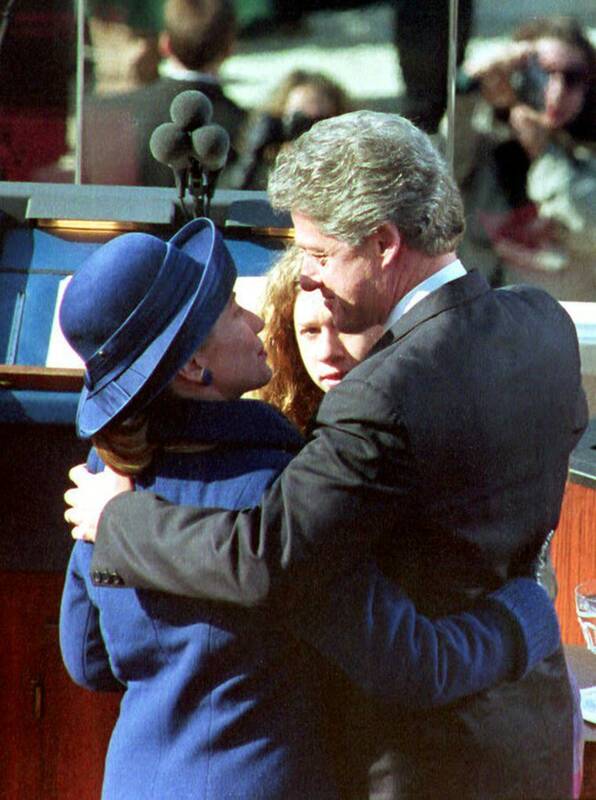 President Bill Clinton hugs his wife Hillary and daughter Chelsea after being sworn in Jan. 20, 1993 as the 42nd president of the U.S.
Hillary Rodham Clinton, left, hugs daughter Chelsea during a farewell address to the people of Arkansas on January 16, 1993, before leaving for the White House and her position as first lady. 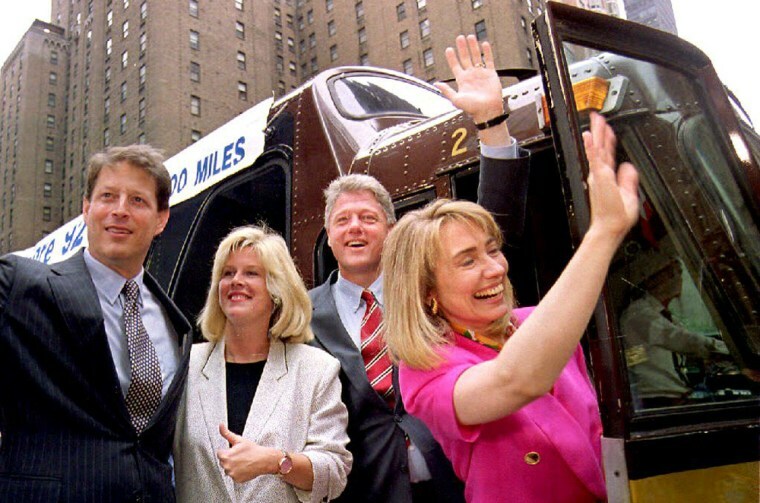 From left, Democratic vice presidential candidate Al Gore, his wife, Tipper, presidential candidate Bill Clinton, and his wife, Hillary, say goodbye to supporters July 17, 1992 before beginning a cross-country bus tour from New York to St. Louis. "60 Minutes" producer Don Hewitt, left, speaks with Democratic presidential candidate Arkansas Gov. 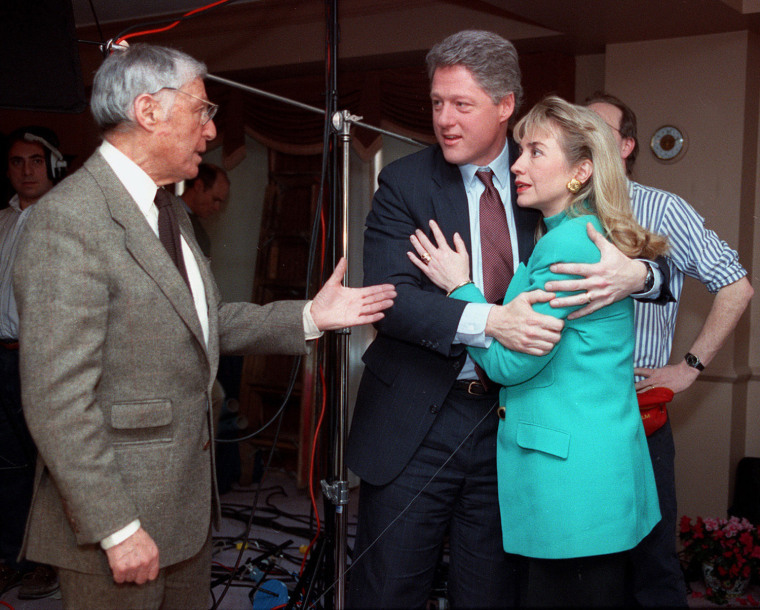 Bill Clinton and his wife Hillary Rodham Clinton, after lights fell during an interview with the couple. During the interviw with Steve Kroft, the two discussed their marriage after allegations that Bill Clinton had a 12-year extramarital affair with Gennifer Flowers. 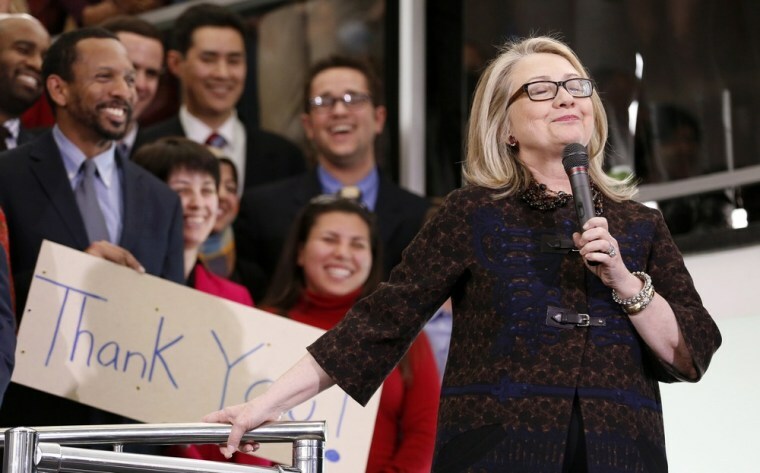 "I'm not sitting here some little woman standing by my man like Tammy Wynette," Hillary said. Former Arkansas Gov. 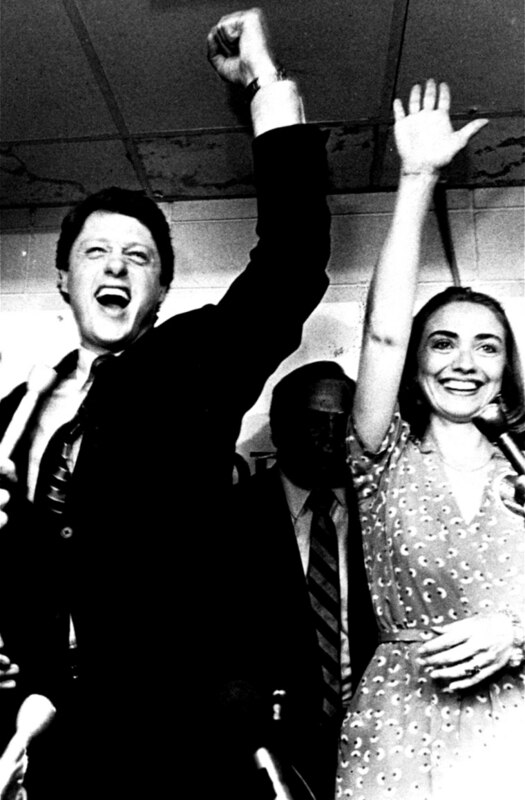 Bill Clinton and his wife, Hillary, celebrate his victory in the Democratic runoff on June 8, 1982 in Little Rock, Ark., defeating former Lt. Gov. Joe Purcell en route to a return to the Arkansas governorship. Arkansas Gov. 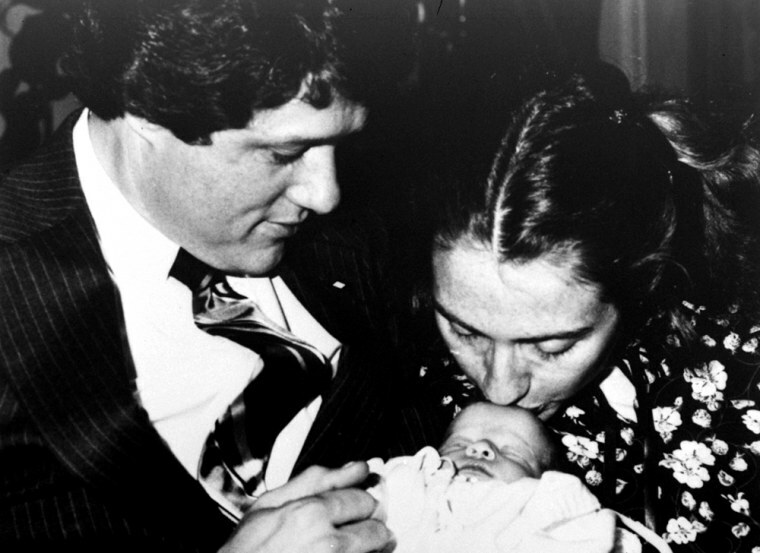 Bill Clinton, wife Hillary Rodham, and week-old baby Chelsea pose for a family picture on March 5, 1980. 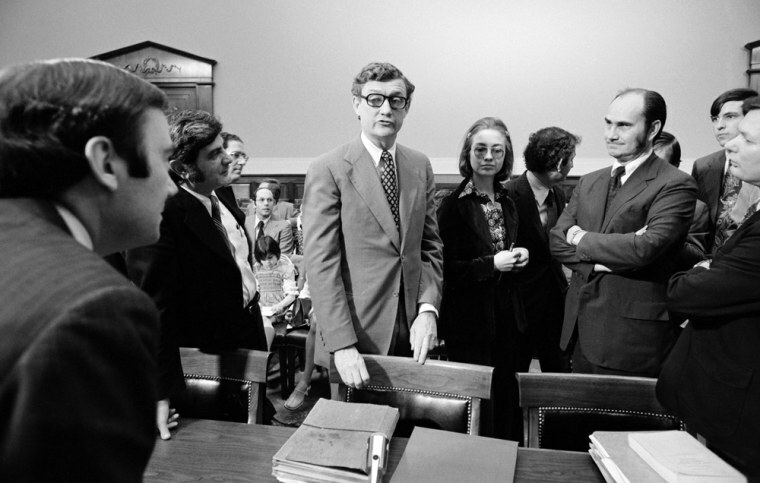 Hillary Rodham (center), a lawyer for the Rodino Committee and John Doar (left), chief counsel for the committee, bring impeachment charges against President Richard Nixon in the Judiciary Committee hearing room at the U.S. Capitol in 1974 in Washington. — David Hume Kennerly / 3rd Party - Misc. At Yale Law School, Hillary Rodham meets Bill Clinton. 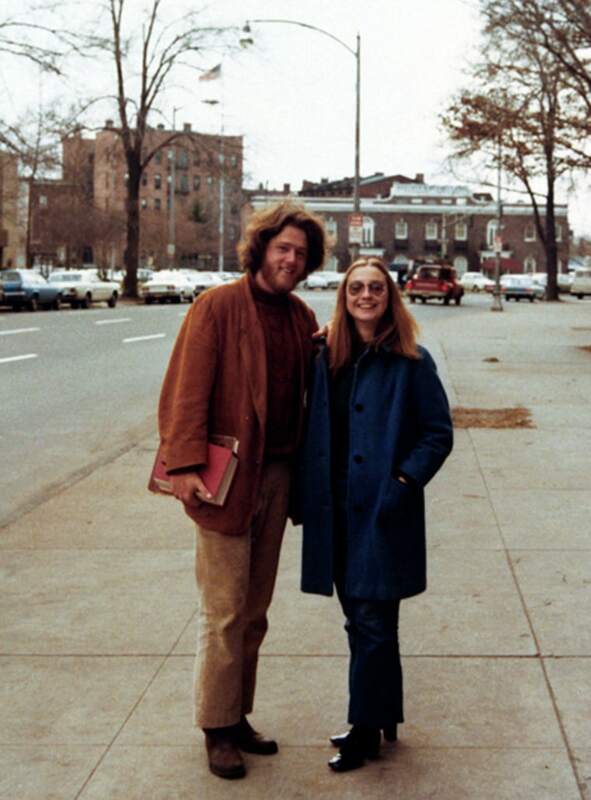 She would write later that the attraction was immediate, and that they shared an intellectual bond that never broke: "Bill Clinton and I started a conversation in the spring of 1971," she wrote in the memoir, "and more than 30 years later, we're still talking." 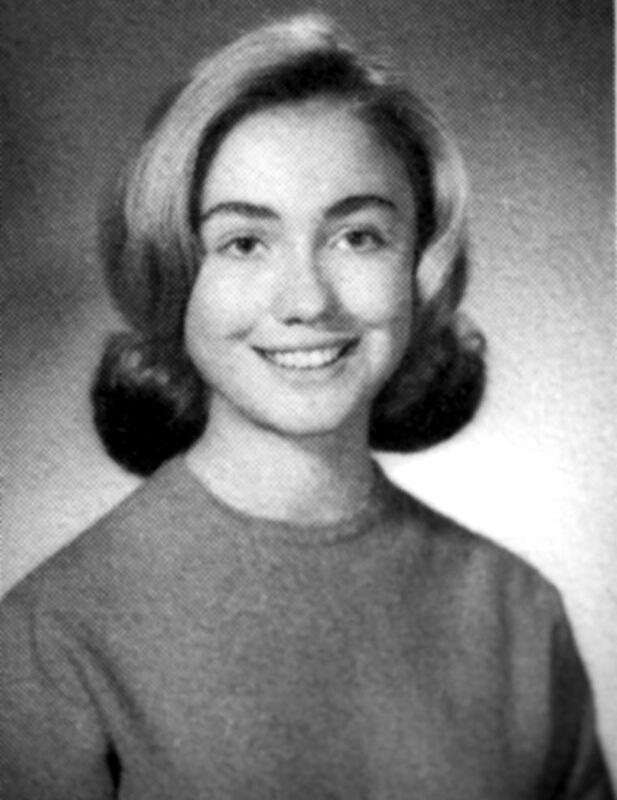 Hillary Rodham poses in her 1965 senior class portrait from Maine South High School in Park Ridge, Illinois.